Who isn’t hoping to find the prized corridor that leads to amazing fitness and freaky weight-loss? And who doesn’t want the path be moderately convenient: not to impede upon your current schedule and not cause any discomfort? Change requires things to change. Change requires awareness, especially about what needs to change. You will know everything you need to know if you read a good health and fitness book. WT…? No! Sorry, but it’s just NOT TRUE. You can build a house out of the truckloads of diet books on Amazon, yet there’s an obesity epidemic in every town. Reading Browsing the diet books we get for Christmas ain’t gonna do it. Plus, you and I have different body types. Every body responds a touch differently to exercise and food. You stand to learn more about YOURSELF and YOUR body when you take the ACTION prescribed in the book. You can lose 20 pounds in 4 months, if you workout 4 days a week. I wouldn’t say it’s impossible, but I would say I hope you have a workout log. I hope you’re planning to advance-schedule ALL your workouts, log the actual exercises, and track your progress each week. And if losing 20 pounds in 4 months really matters to you, I suggest you keep a journal and write your feelings. Write your goals. Confront your fears. Confront your feelings. Because 20 pounds isn’t worth a drop of water. A twenty pound weight change is like finding gold! You’re gonna need to dig and remain tenacious, focused, and committed. Look at a snapshot of one of my workout journals. Yep, that’s a page of my DUMP–it’s what I call it when I’m dumping out my feelings. Like clearing out my inner obstacles. Beside it is the book I’m writing now. It’s a workout log. Plus, more. For 20 less pounds, my book will help you. It’ll be ready by Earth Day, in time for Spring! You can transform your body all by yourself. Sorry, but it’s pretty much NOT TRUE. And if it were TRUE, it’d be a rare phenomenon. Generally, we can go farther and achieve more with support, guidance, coaching, and the elevation of standard we energetically pick up by simply being in the company of folks with similar goals and elevated habits! A trainer, a teacher, or a friend will give you one or all the above. Peer groups you create in exercise spaces or a meet-up or a Facebook group help. Go ahead and find people to celebrate you. Keep up with the Rabbits: people that keep you running at a faster pace of belief and action. All this is better than trying to do your goals by yourself. Transform your habits, transform your body. Keep notes when you read. Post reminders or quotes from the books that inspire you. Find a teacher, trainer, or a friend to draft you to your pot of gold. It’s february. Where are your resolutions? Thanks Oby for the interview! my knees hurt just about everyday. in my legs or abs. My weak leg muscles and heavier BODyweight contributed to lots of pressure on my knees. People (kinda carelessly) told me I needed to lose some weight and my knees wouldn’t hurt so much. Yeah, well, it sounded like a catch 22. How was I to lose the weight so I could exercise without pain, if the exercise was in itself the cause of my pain? There’s a way, though. I found it. First, be well informed whenever you have joint pain it is best that you consult a professional physical therapist to rule out a major structural issue that requires rehab. However, if you are cleared to exercise, by all means – superstar, get to movin’ – mindfully! 1. Don’t run or jump — instead — use the elliptical, ride the bicycle, strength train, and opt for a low-impact aerobics class. If the class you want to take is built around fast direction changes, abrupt starts and stops, or stomping — chill. You need to modify all that stuff until your quads and hamstrings get strong enough to support your knees. Remember, pain in a joint, ain’t good! 2. Do yoga. I’m not a Pilates hater. In fact there are leg strengthening exercises in Pilates that you can benefit from. I just recommend Yoga classes because they implement balancing poses and core building that uses the whole body. Isometric training for legs (holding poses without moving) and holding the body in alignment with core strength will help you become more conscious of how to position yourself properly – they improve stabilization and increase muscle awareness. Isometric training for the legs is essential to strengthening your knees! 3. 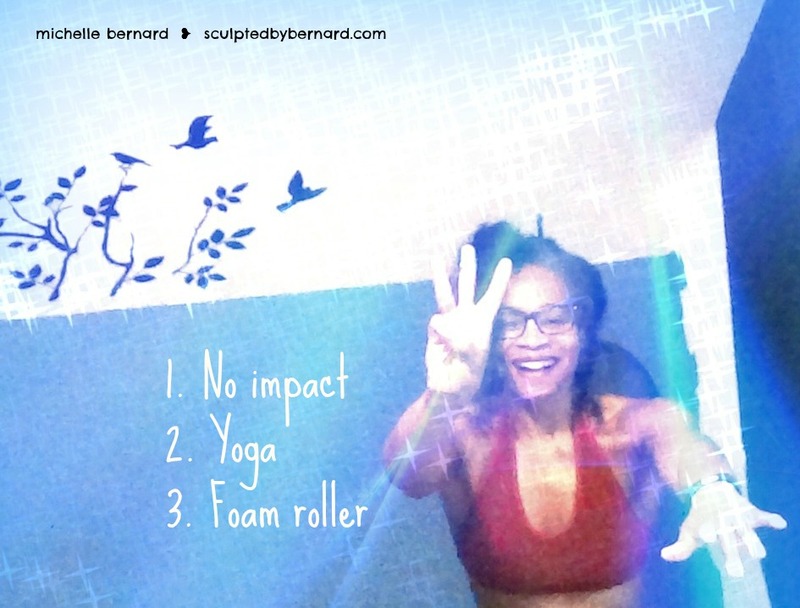 Roll out with the foam roller! then stretch — The foam roller is your miracle tool. It will release all of the tight areas around your gluteus, back, and legs. Use the foam roller to massage the knots and adhesions in these areas for about 2 minutes in each location. Only roll out till you notice the muscle feels better. A little each time is better than rolling till your legs turn to jelly, which can actually be damaging to the tissues. After you roll out, stretch. You’ll be amazed by how much more flexible you are after using the foam roller. Your knees might hurt because of your shoes. Especially when the seasons change, we tend to changes our shoes(consider the heel difference of summer sandals to cold weather boots). Your physical alignment shifts when the heel height and support from your shoe changes. Your body has to readjust itself from the heel to knee to hip to back. With the proper modifications and a load of patience (it might take months for you to feel stronger), you can keep movin’ toward your goals. Listen, BODyLOvers, protect your knees. Focus on keeping them healthy. Whatever we focus on gets stronger.